Designed by the respected marimba soloist, teacher and masterclass instructor, the Vic Firth Robert van Sice Signature Marimba Mallets were designed by their namesake and feature an exclusive hand-wrapping technique that virtually eliminates the sound of bar contact. A special interlocking stitch pattern maintains the integrity of the head. Models with a rubber core are mono-tonal, while the synthetic core models are multi-tonal -- allowing the sound to brighten and darken as the dynamics increase and decrease. 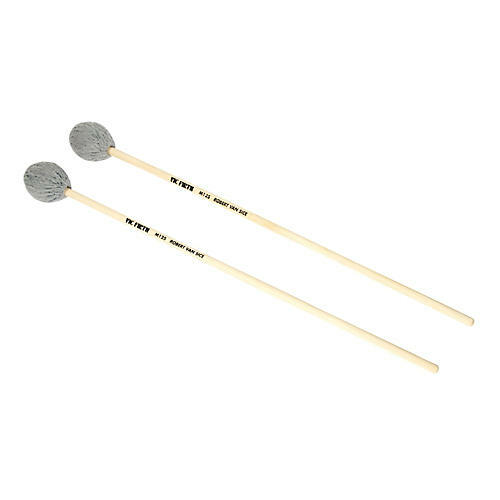 The 17" maple handles provide excellent feel and control at extended intervals.